Why Does Big Tobacco Get to Control the Conversation at the Point-of-Sale? Last week, the Second US Circuit of Appeals court last week ruled in favor of Big Tobacco who aggressively markets their deadly, addictive products to youth. In NYC, the NYC Coalition for a Smoke-Free City and our many community partners work to protect the public health, but as a result of this ruling, retailers won’t be required to display educational warning signs on the harmful health effects of smoking. The proposed graphic health warnings were first introduced by the NYC Department of Health in 2009 and were intended to show New Yorkers what cigarettes can do to you. “These warning signs will help persuade smokers to quit and show children why they shouldn’t start to smoke,” said Health Commissioner Thomas Farley at the time. 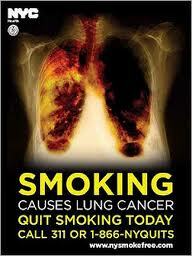 But Big Tobacco filed suit in June 2010 claiming the signs violated their rights. And now the court has defended their right to promote deadly products instead of allowing public health officials to teach and warn our children. According to the Surgeon General ninety percent of adults smokers started before the age of 18. That is a sobering statistic and tells us that Big Tobacco’s marketing works. In New York state alone, Big Tobacco spends $1 million a day on marketing. Retail stores are one of the last places where the tobacco industry can target our youth. 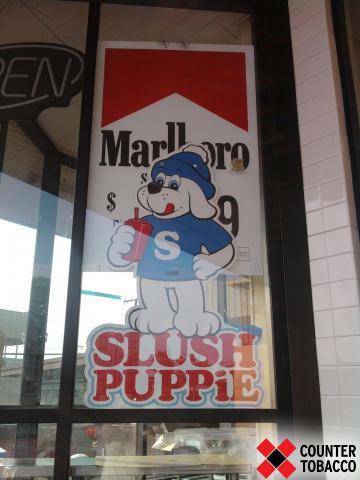 Why does Big Tobacco get to control the conversation with their ads in these stores? Why can’t the dangers of smoking and tobacco use also be clearly communicated as well? Tobacco ads don’t give any of the facts—they are designed to lure youth, using themes that appeal to adolescents and vulnerable populations. Recent tobacco ad campaigns have tried to re-frame smoking as an “acceptable rebellion” within a hipster aesthetic. They prey on adolescents’ longing to be “cool”, independent and free, as well as attractive, popular and adventurous. It’s hard to dispute that some marketing is specifically targeted to children. Yet, Big Tobacco would have us believe otherwise. There are approximately 10,000 licensed tobacco retailers in NYC, three-quarters of which are located within 1,000 feet of a school. With over two-thirds of teens shopping in these retail stores at least once a week, who informs teens before they light up? Why aren’t words enough? A new study comparing the effectiveness of the graphic warnings vs. the text-only warning label that has been used in cigarette ads since 1985, shows that the graphic warnings improve the chances that a smoker will take information about smoking risks to heart. An image speaks a thousand words, so why can’t we paint the real picture for smokers and our children who are being actively targeted? The FDA hopes to replace the current text-only warnings with graphic images that show kids what smoking can do to you. Big Tobacco is fighting those labels, claiming they violate their free speech rights. Words on a carton are not enough to save our youth. We need to show very simply and graphically the truth: smoking kills. This entry was posted in Education, Legal, New York City & State Efforts, Public Health Issues, Tobacco Marketing, Youth and tagged Big Tobacco, FDA, point-of-sale, Surgeon General, Thomas Farley, tobacco marketing by nycsmokefree. Bookmark the permalink.